DIRECTV Hotel, Hospital, Assisted Living and other Institution Customers Will Now Be Able to Add SHOWTIME® to Their ENTERTAINMENT Lineup for just $0.99 per room, per month for up to 5 Years! Great news! For a limited-time only, new and existing DIRECTV Lodging & Institution customers can add the SHOWTIME® Package as a 2nd Premium for only $0.99 per room, per month. That’s 60% off the original rate of $2.50 per room, per month! Beginning 12/18, you can subscribe to this premium channel with original hit shows like Shameless™, Ray Donovan™, The Affair™ and Homeland™ for the lowest price ever! The SHOWTIME programming offer ($0.99/room/mo.) is available only as a 2nd Premium add-on. Offer available to qualifying new or existing Hospitality and Institutions accounts with a 36- or 60- month programming agreement and must not have received SHOWTIME programming from DIRECTV or any other distributor during the 24 months prior to activation. Offer is available for accounts activated on or before 6/18/16. After the applicable promotional period (36- or 60- mos.) ends, then-prevailing rate for SHOWTIME applies unless canceled or changed by customer prior to end of the promotional period. 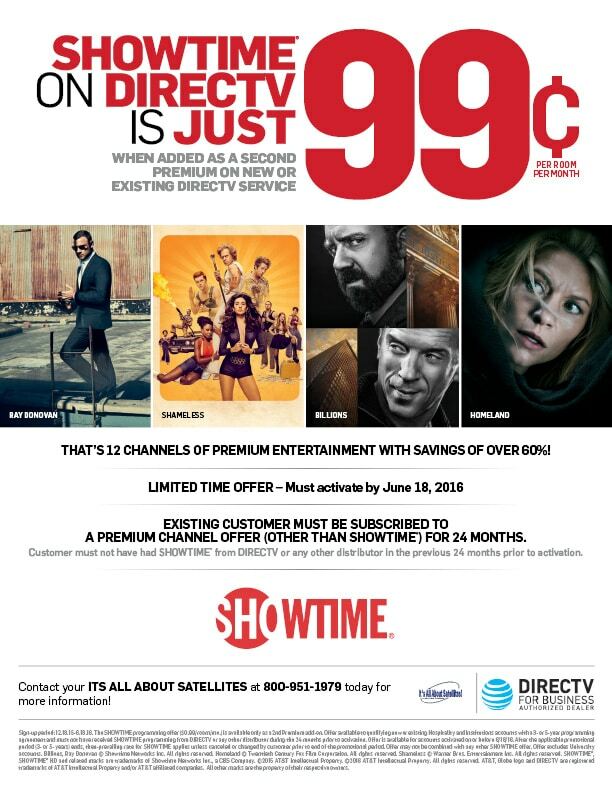 Offer may not be combined with any other SHOWTIME offer. Offer excludes University accounts. ©2015 AT&T Intellectual Property. All rights reserved. AT&T, DIRECTV and all other DIRECTV marks contained herein are trademarks of AT&T Intellectual Property and/or AT&T affiliated companies. All other trademarks and service marks are the property of their respective owners.